Compounds labeled with carbon-14 and tritium are indispensable tools for research in biomedical sciences, discovery and development of pharmaceuticals and agrochemicals. 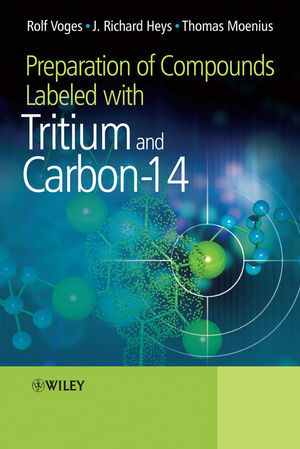 Preparation of Compounds Labeled with Tritium and Carbon-14 is an essential guide to the specialist strategies and tactics used by chemists to prepare compounds tagged with theradioactive atoms carbon-14 and tritium. Rolf Voges studied chemistry at the Universities of Marburg and Freiburg, where he received his Ph.D. in organic chemistry on investigations into steric isotope effects, for which he received the Go¨deke Award. After postdoctoral research on stereoselective syntheses he joined the isotope group of Sandoz Pharma AG (now Novartis AG) being involved for thirty years in organic radiochemical synthesis as Head of the Isotope Laboratories and then Head of Isotope Section. He is author or coauthor of about 40 publications, one patent, and coeditor of two previous conference proceeding volumes in the field, co-organizer of two international symposia on the synthesis and application of isotopically labeled compounds, founder and co-organizer of eleven Bad Soden meetings of the Central European Division of the International Isotope Society (CED-IIS), and co-editor of the proceedings. For three years he held a leadership position in the IIS, serving as its 2001 president. In recognition of his scientific achievements and his service to the isotope society he received the IIS-CED Award in 1995 and in 2003 the IISAward. He is now retired and lives in southwestern Germany, near the Swiss and French borders. Richard Heys received his Ph.D. in organic chemistry from Stanford University in 1976 and conducted postdoctoral research in the chemistry department at Yale; both involved the synthesis of radiolabeled compounds and their use in elucidation of biosynthetic pathways. His subsequent 29-year career in organic radiochemical synthesis both in the laboratory and as a manager took him to the Radiochemistry Department of Midwest Research Institute (now part of Aptuit, Inc.), Smith Kline & French Laboratories/SmithKline Beecham Pharmaceuticals (now GlaxoSmithKline) and AstraZeneca Pharmaceuticals. Author or coauthor of over 85 publications, 8 patents and a previous conference proceedings volume in the field, organizer of an international symposium on the synthesis of isotopically labeled compound and holder of leadership positions (including president and CFO) in the International Isotope Society for 9 years, he is retired and lives in northwestern Connecticut. Thomas Moenius received his Ph.D. in organic chemistry from the University of Erlangen-Nu¨rnberg in 1986. He is a member of the isotope group of Novartis Pharma AG, working in the field of carbon-14 and tritium labeling. Since 2007 he is also European Editor for Journal for Labelled Compounds and Radiopharmaceuticals. 1.1 Physical Properties of Tritium and Carbon-14. 1.4 Stability and Storage of Compounds Labeled with Tritium or Carbon-14. 1.5 Specialist Techniques and Equipment. 2 Strategies for Target Preparation. 3 Preparation of Tritium-Labeled Compounds by Isotope Exchange Reactions. 3.1 Homogeneous Acid- or Base-Catalyzed Exchange. 3.2 Heterogeneous Catalysis with Tritium in Solvent. 3.3 Heterogeneous Catalysis in Solution with Tritium Gas. 3.4 Homogeneous Catalysis in Solution with Tritiated Water. 3.5 Homogeneous Catalysis with Tritium Gas. 4 Preparation of Tritium-Labeled Compounds by Chemical Synthesis. 4.4 Small Tritiated Building Blocks. 5 Barium [14C]Carbonate and the Preparation of Carbon-14-Labeled Compounds via One-Carbon Building Blocks of the [14C]Carbon Dioxide Tree. 6 Preparation of Carbon-14-Labeled Compounds via Multi-Carbon Building Blocks of the [14C]Carbon Dioxide Tree. 6.1 [14C]Acetic Acid and Its Derivatives. 7 Preparation of Carbon-14-Labeled Compounds via the [14C]Cyanide Tree. 7.2 Preparation of Other Building Blocks from [14C]Cyanide. 8 Preparation of Carbon-14-Labeled Compounds via the [14C2]Acetylene Tree. 8.3 [1,2-14C2]Acetic Acid (14CH3 14COOH). 8.4 2-[2,3-14C2]Propyne-1-ol ([2,3-14C2]Propargyl Alcohol) and 2-[2,3-14C2]Butyne-1,4-diol. 8.5 Methyl [2,3-14C2]Propiolate (H14C≡14CCOOMe) and Dimethyl [2,3-14C2]Acetylenedicarboxylate (HOOC14C_14CCOOH). 8.8 [14Cn]Benzene and the Synthesis of Ring-Labeled Aromatic Compounds. 9 Preparation of Carbon-14-Labeled Compounds via the [14C]Cyanamide Tree. 11 Preparation of Enantiomerically Pure Compounds Labeled with Isotopes of Hydrogen and Carbon. 12 Biotransformations in the Preparation of Compounds Labeled with Carbon and Hydrogen Isotopes. 12.1 Applications of Isolated Enzymes. 12.2 Application of Cell-Containing Systems. 12.3 Biocatalyzed Synthesis of Key Intermediates for Reconstitution Approaches.